Willy Wonka Jr. this weekend! Get your tickets today! Performances will be on Friday, Nov. 2 at 7 p.m. and Saturday, Nov. 3 at 2 and 6 p.m. in the Grace Chapel gymnasium (Entrance 3). Featuring the enchanting songs from the 1971 film, in addition to a host of fun new songs, “Willy Wonka Jr.” is a scrumdidilyumptious musical guaranteed to delight everyone's sweet tooth. Tickets are $7 each and may be purchased at the door or online here. Audience members will enjoy the talents of more than 100 middle school and elementary school students who comprise the cast and crew. 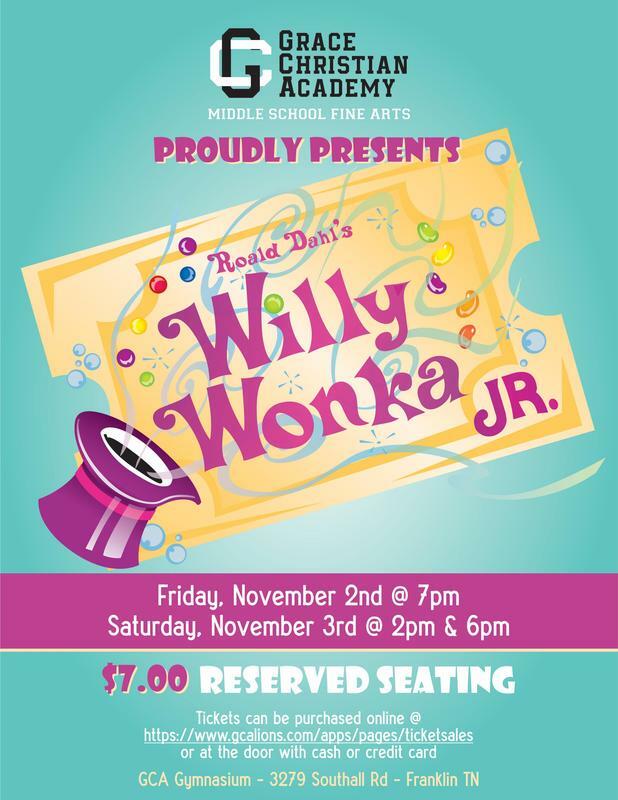 This musical treat for the entire family will feature plenty of surprises, including a Willy Wonka Chocolate Bar Contest for the audience with a chance at three golden tickets. “Willy Wonka Jr.” follows enigmatic candy manufacturer Willy Wonka as he stages a contest by hiding golden tickets in five of his scrumptious candy bars. Whomever comes up with these tickets will win a free tour of the Wonka factory, as well as a lifetime supply of candy. Four of the five winning children are insufferable brats, but the fifth is a likeable young lad named Charlie Bucket, who takes the tour in the company of his equally amiable grandfather. The children must learn to follow Mr. Wonka's rules in the factory – or suffer the consequences. For more information, call GCA at 615-591-3017.